They call it Dynamite cause it's the bomb! The latest 7" smash on the rockin' reissue imprint sees the spectacular climax from Port Authority's 1971 self titled debut land on a single for the first time ever. Fresh to death and now with a super loud 45 cut, this monster can growl like it was supposed to - hittng you with those heavy horns, blaxplo attitude and wild psychedelic guitar riffs, before dropping into one of the finest drum breaks of all time. Total 10/10 jazz-funk HIT here folks. Don't sleep! 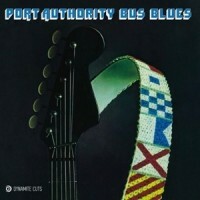 Patrick says: Dynamite Cuts hit us with a total killer here in the form of Blaxploitation tinged jazz funk monster "Port Authority Bus Blues". Wild psychedelic guitar, big horn hits and a KILLER drum break make this a classic!